I love soups! Especially when it's freezing outside - definitely a delicious way to warm up. 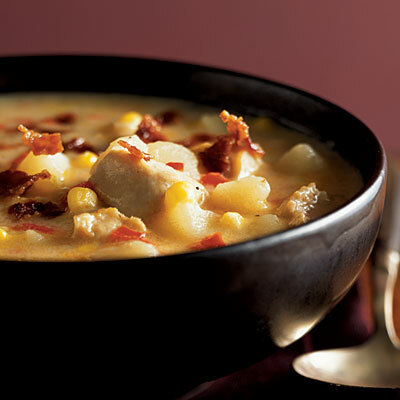 I found an appetizing recipe on CookingLight for a Cheddar Chicken Chowder - yum! The following recipe serves 7. Perfect on a cold night like this! Oh I wanna try it! Yummy! This looks so yummy- and super comforting with as cold as it is outside! I think im going to try this recipe! Have a look at my blog when you get a chance! That looks so yummy and perfect for this freezing weather! I'm going to try to eat more soups this year (not necessarily a resolution, just something I'd like to do more of), and this chicken chowder looks yummy. Oh, that looks like comfort food in the making! Yummy, your photo makes it look amazing! I'm stopping by from blogger.com & I'm following you via bloglovin. I can't wait to see more recipes like this one and other great posts. I'm off to look around. I hope you have a great Friday! That sounds absolutely delicious. I'm saving this recipe for when it gets cooler here! i love a good chunky chowder! this looks great audrey! Wow this looks damn tasty I;ll save this recipe thank you so much for sharing !!! Wishing you a good year ahead and more of your fab recipes! Omg this looks so good! I love chowders & soups this time of year! Oh lady, put the word "chowder" in anything and I am in - that looks delish, thanks for sharing!